The Rooftop Cafe is located directly across the street from the Starbucks coffee house and Pizza Hut, and is near the Hunter Plaza. Walk down the hill from the Dong Men bus station about fifty yards and turn right. You climb the stairs and turn left at the top of the stairs, walking through a steel door into a large lobby area. Go to the elevators on the far side of the lobby and go up to the 30th floor. The room number is 3004. 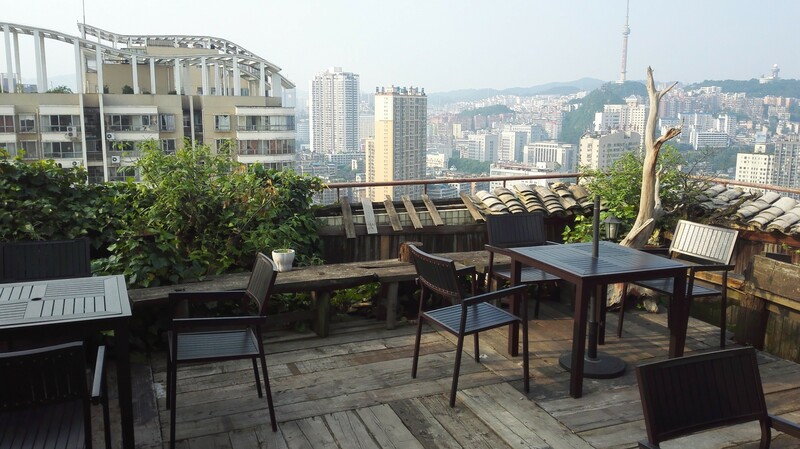 The Café is located on three levels, literally a rooftop garden. Manager Shadow and her assistant. The The Rooftop Café has four meeting rooms including the third level floor which is a private area which might be called the building’s 32nd floor. There are panoramic views of the city from all three floors. The cafe is decorated with a local Guizhou wood, which appears to be cedar, very warm wood walls and floor. The furniture is also wood. The Cafe mainly serves coffee however it has fruit juice, cocktails, beer, and some desserts. Prices are very competitive, particularly in this neighborhood. The manager’s name is Shadow and if you have questions, or if you have a group that needs a meeting room, be sure to call her at 1-398-411-3214. Go to Dong Men and walk down hill about 50 meters. Climb the stairs and turn left at the top. Enter through the steel doors. Unit 2004 on floor 30. This entry was posted in Food, Jack, Maps and Places by admin. Bookmark the permalink.